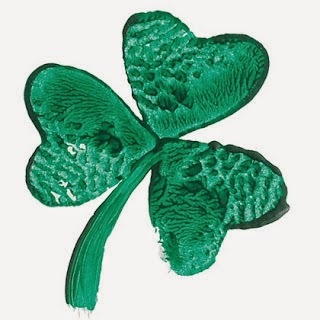 How Does Your Family Celebrate St. Patrick's Day ~ Start a New Tradition? It's an alarming trend that shows no sign of abating: every year, more and more people fall victim to leprechaun-related mischief around St. Patrick's Day. 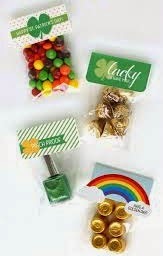 You too can join in the fun with your kiddos by "playing" leprechaun ~ give your kids something to talk about for weeks in advance, wondering what things the leprechaun will do when he visits your house. Can't you just imagine what the St. Patrick's Day home invasion could bring ~ Green milk? Green toilet water? Green footprints? Trails of shamrock confetti? Heck you can even plant kisses.....what will the kids think when wake up with green kiss marks on their foreheads? Is it any surprise, then, that your kids may decide to fight back ~ maybe they will want to try to capture that little leprechaun whose creating havoc in their home (could be tons of fun, huh). 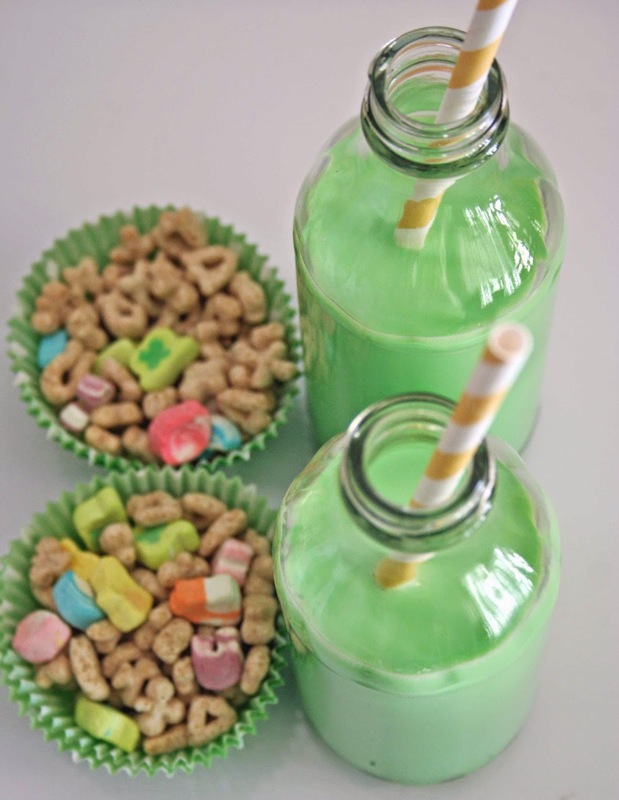 Get creative with your kiddos ~ use some pretty powerful bait such as Lucky Charms cereal ;), create and set traps that have caught only chocolate gold coins and candy bars, accompanied by notes taunting them with "Good try," or "Can't catch me!" 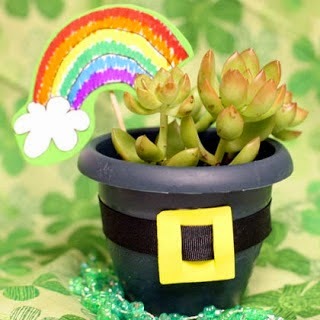 As everyone knows, leprechauns hoard pots of gold, and if caught, must reveal the treasure's location to their captor. 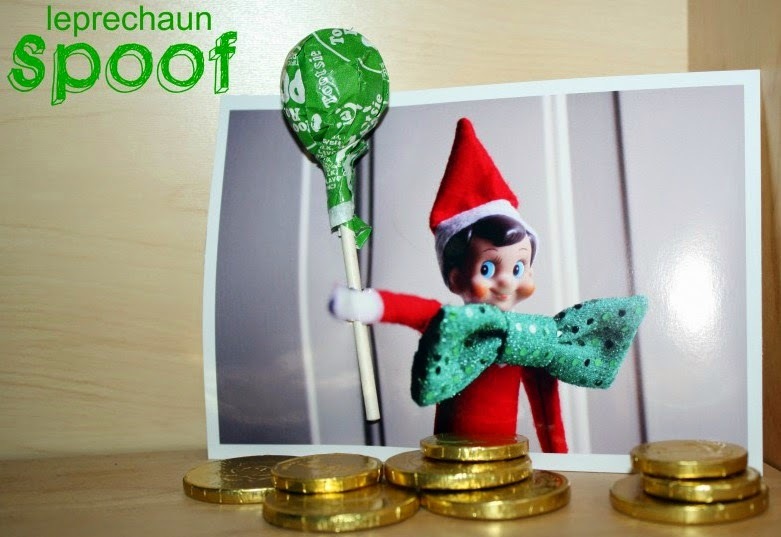 Have your "elf" from Christmas (or whatever) come back to life on St. Patty's Day. Allow him to play tricks and leave treats all throughout the house so your kids can see what mischief he's been dishing out! Create a clever trap for taking a stand against leprechauns' St. Patrick's Day mischief. 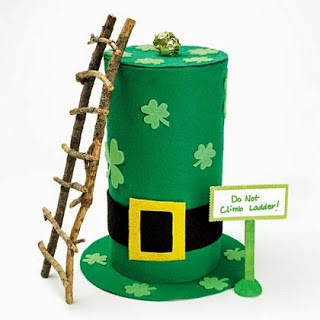 It's for the sake of kids, the St. Patrick's Day mischief fighters, that you need a state-of-the-art leprechaun trap. This is easily made from ordinary household materials and uses lures and baits drawn from the latest research in leprechaun psychology. Use this designs and customize it to make something unique: leprechauns, as we all know, won't be fooled by the same trap twice! 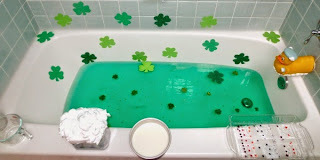 Add some food coloring to the toilet and bathwater so the kids can take a green bath. You can also change out the toothbrushes in the toothbrush holder and add green apple pixi stix or the like. Have the "elf" leave "footprints" as to where he's been in the bathroom while reaking havoc ~ just dip your pointer finger in green paint and leave prints around the toilet lid and seat, the bathtub rim and even the bathroom counter. 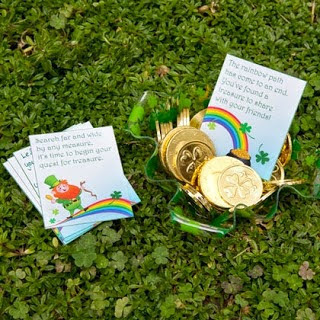 Hide some gold coins of your own, fill out the cards with clues, and send kids off on a fun treasure hunt! Suggested clues: Search far and wide by any measure, it's time to begin your quest for treasure. The rainbow path has come to an end. You've found a treasure to share with your friends. Left and right you'll turn your head, when you look underneath your bed. Make treat bags with your kiddo and have them pass them out at school. It will be a nice a surprise for several students as this isn't a typical party day at school where treats, games and crafts where parents are allowed to come in and take over for a portion of the day (at least in our school district). 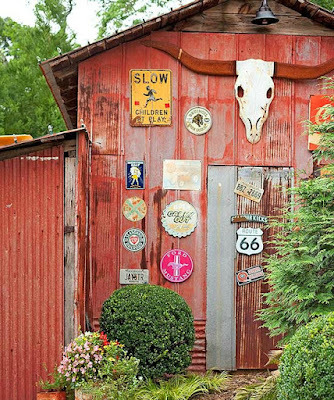 Dress up an inexpensive plastic planter with a belt and buckle and a cheerful rainbow pick. 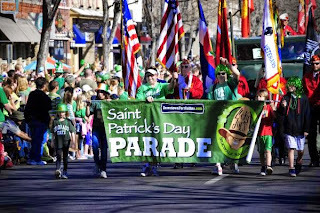 There are so many St. Patty's Day parades across the country that I am sure you and your family can locate one within a 30 mile radius. 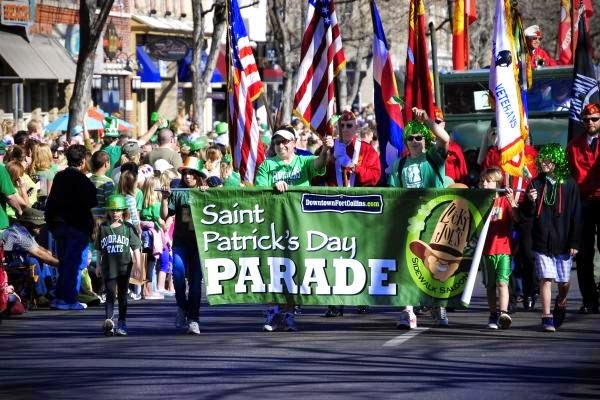 Find out where the closest one is, dress the part for parade viewing, load everyone and everything up, hop in the car and find your spot to watch the parade!